Just north of Silver Peak on S.R. 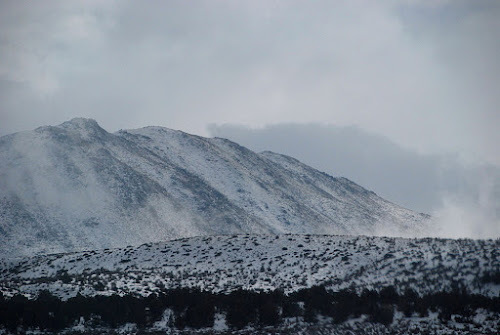 265 and just downhill from Mineral Ridge, one of Nevada's most accessible basaltic cinder cones rises out of the low alluvial slopes. 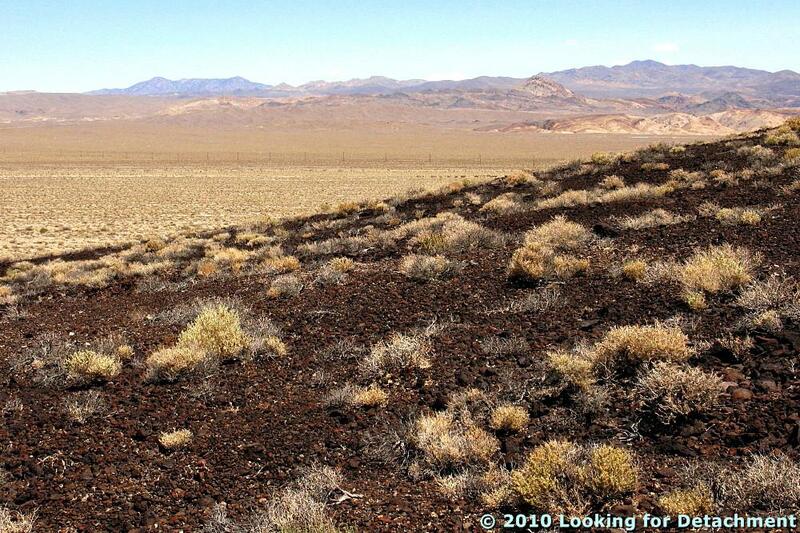 The photo, taken from the northeast side of Mineral Ridge, where we made our last stop, shows the basalt cinder cone known as "The Crater" sitting in front of a southern bit of the Weepah Hills, the more distant and linear Paymaster Ridge, and the Clayton Valley playa, with its pale turquoise lithium brine fields. A Google Earth view of The Crater and associated basalt flow rock. The cinder cone is assymetrical, as are many, with a breached east-facing side, where basalt lava flows erupted and spread downslope toward the Clayton Valley playa. The cone is right beside S.R. 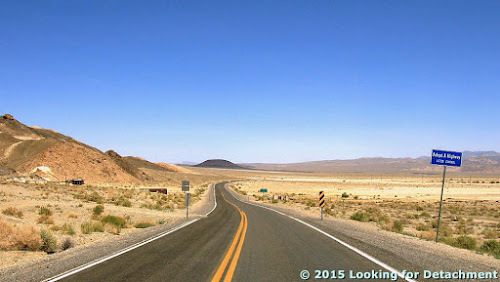 265, just north of Milepost 4, between Silver Peak and Blair Junction (see the map below). Access to the cone includes a two-track dirt road on the south side and a pullout on the northwest side. 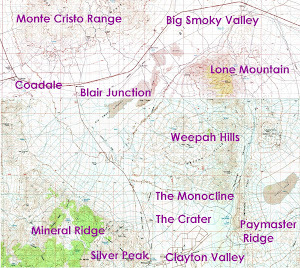 Click to enlarge this location map, the spliced and labeled Tonopah and Silver Peak 30x60 sheets, courtesy USGS. I pulled into a flat area on the northwest side of the cinder cone and walked around a little bit, stopping briefly while on my way to elsewhere: In 2010, I was on a loop from Tonopah to the Klondyke mining district to Silver Peak and Mineral Ridge and then back to Tonopah; in 1976, I was leaving Mineral Ridge to go to my next stop in California. 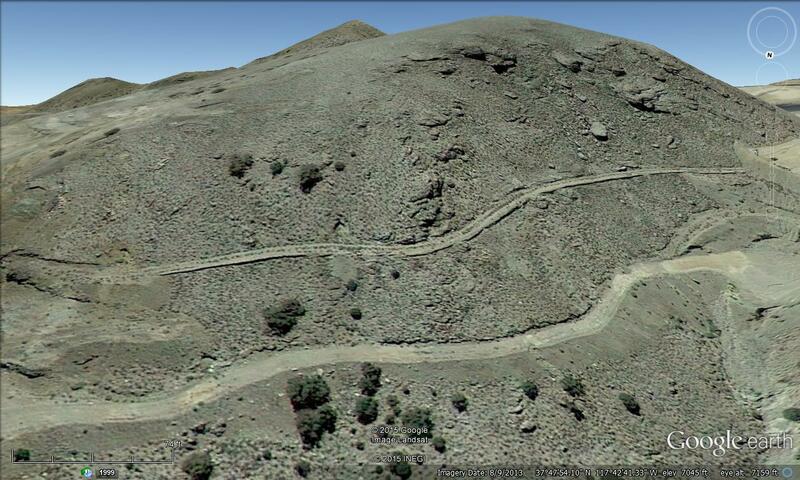 Both trips took me past the cinder cone; both trips resulted in my next immediate destination being Blair Junction. The Crater, looking southeast from its northwestern flank. 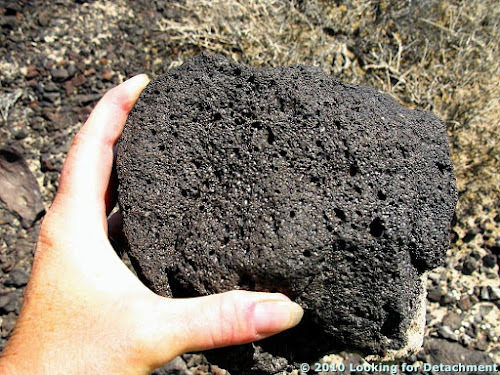 The cinder cone—at least the small chunk I saw—is composed dominantly of basalt blocks and bombs and smaller, lapilli-sized fragments. A basic grain-size classification scheme for tephra, pyroclastic fragments that were thrown out of volcanoes, courtesy USGS. 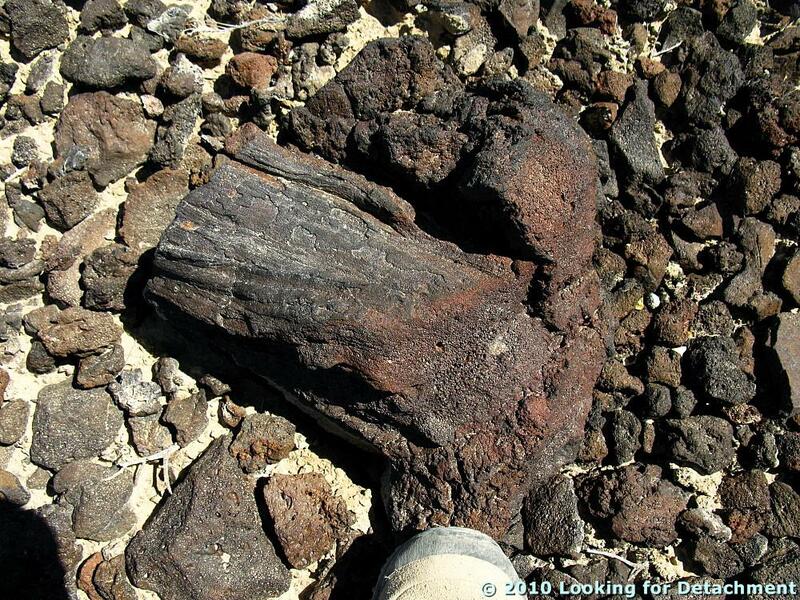 All the other references I found state that the cone is about 390,000 years old without providing credit to an original source. After parking and getting out of the truck, I walked around for a little while, trying to find some good examples of volcanic bombs. Rather than collecting any hand samples, I took a few photos. 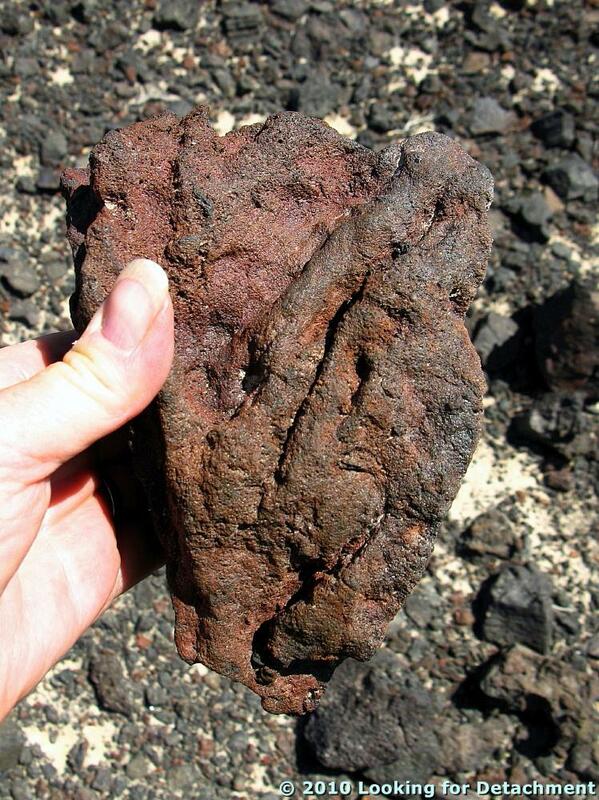 This hand specimen from The Crater doesn’t show any indications that it was molten or semi-molten when it was thrown out of the vent or when it landed on the cone’s slopes—it is therefore considered a block and not a bomb—but it does show the average character of the basalt: dark-colored and with lots of small to medium-sized vesicles. 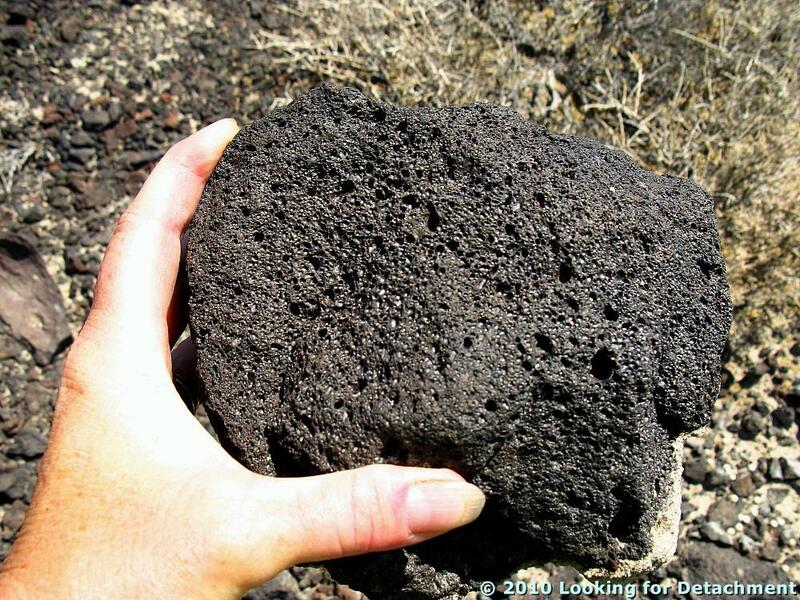 The basalt is reported to contain phenocrysts of feldspar, hornblende, pyroxene, olivine, and magnetite (Price and Price, no date). I readily identified the small, light greenish olivine crystals in the basalt, though I didn’t get any pictures of the phenocrysts. 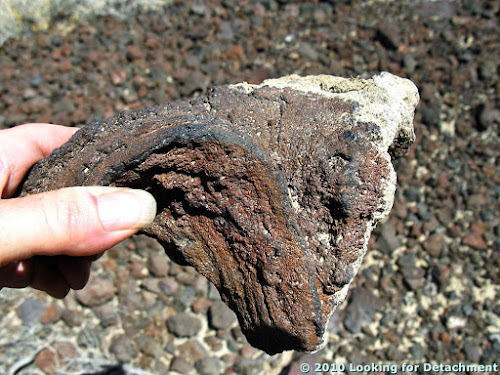 Volcanic bomb with a ropy or fluted texture. The bomb is elongate in shape, and one end is wider than the other. Possibly the narrow end was upward when the bomb fell, still viscous, through the sky. This could be a bit of flow or cooling texture in a basalt lapilli, but I'm not sure. 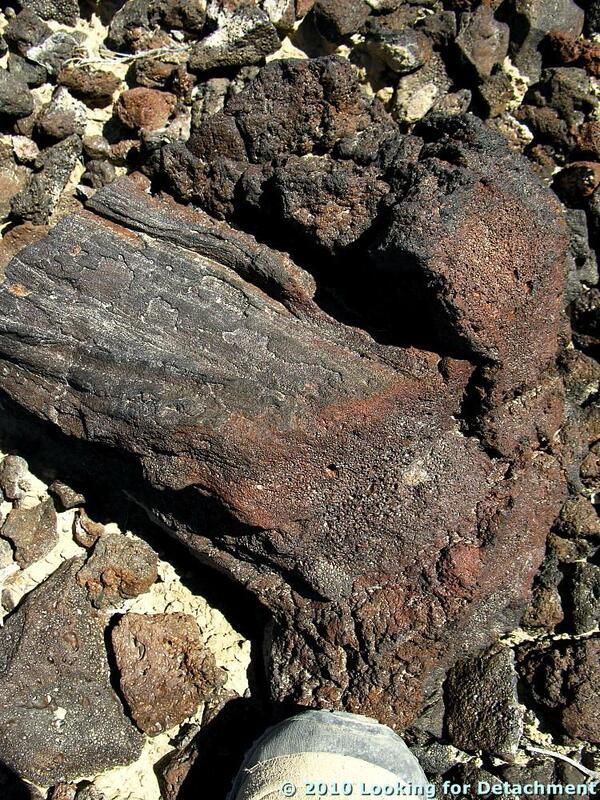 A large block of basalt with ropy and vesicular texture. Am I seeing some aerodynamic shaping in this block, and perhaps some slight breadcrusting? Is this a bomb? And here's a closer shot. Here's a bomb with fluted texture, approaching spindly. I probably should have looked harder for better examples of bombs, and maybe next time I visit, I’ll get around to the far side of the cone—or even up to the top! 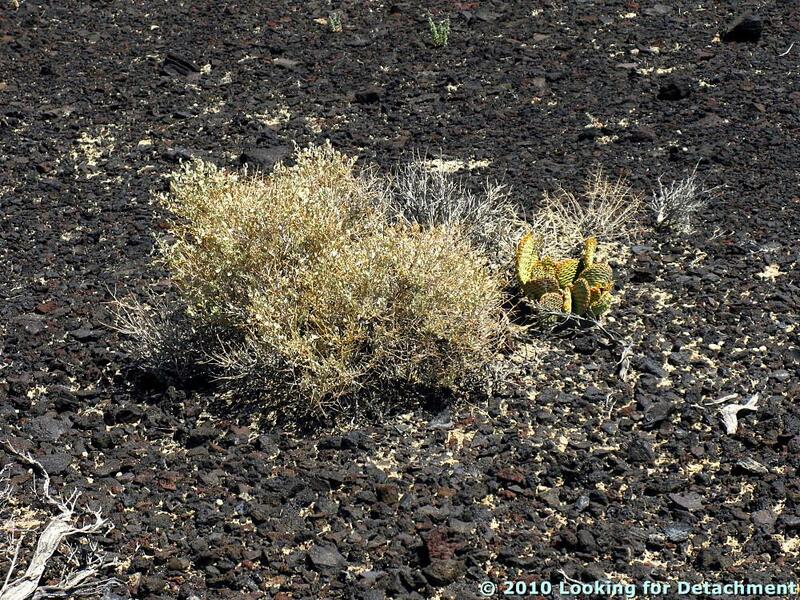 A spiny bush and a prickly pear cactus growing on a desert pavement of basalt lapilli, small blocks, and bombs. The bush looks like some kind of Atriplex or generic "saltbush," but I'm not sure which kind. Any ideas? 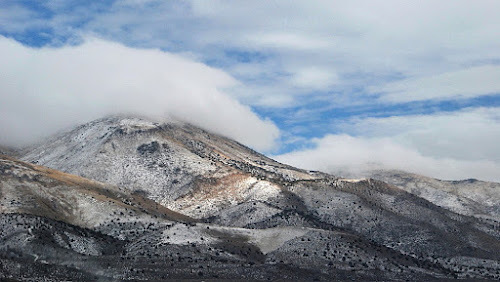 We can see the Weepah Hills and bluish Lone Mountain off to the northeast, beyond the dark, lower slopes of The Crater. Next in this series, we'll head over to California. Albers, J.P., and Stewart, J.H, 1972, Geology and mineral deposits of Esmeralda County, Nevada [available for sale only]: NBMG Bulletin 78, 80 p.
Hulen, J.B., 2008, Geology and Conceptual Modeling of theSilver Peak Geothermal Prospect,Esmeralda County, Nevada: unpublished report for Sierra Geothermal Power Corporation, 23p. 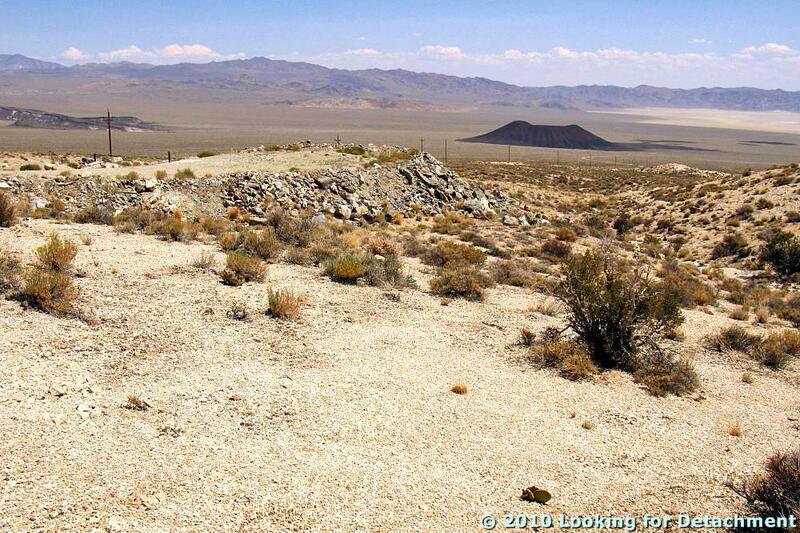 Price, J.G., and Price, E.M., no date, Cinder cone in Clayton Valley, Esmeralda County, Nevada: NBMG, Nevada EarthCaches webpage (with .kmz downloads available), accessed 18Feb2016. Spurr, J.E., 1906, Ore Deposits of the Silver Peak Quadrangle, Nevada: U.S. Geological Survey Professional Paper 55, 174 p.
Finding a Thesis: Next Stop, Silver Peak! Finding a Thesis: Views and Geography and ... Oh, What's That? 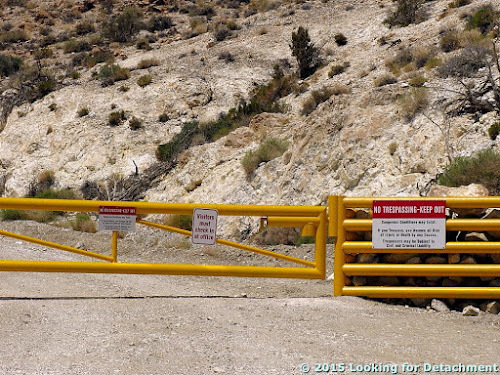 And so, we'll leave the millsite and locked gate on the northeast side of Mineral Ridge to get on with thesis hunting outside Nevada, for a change, and ... what's that up ahead? As we round the bend, The Crater, a basalt cinder cone comes fully into view. The Crater, beyond the metal posts of the old gate. In the photo above, the low range of hills beyond the Clayton Valley playa on the right is Paymaster Ridge, which we first saw quite a while ago on our way into Clayton Valley from the east. The rest of that hilly, mountainous mess, I mean mass—from directly behind The Crater and northward, to the left—is the Weepah Hills. 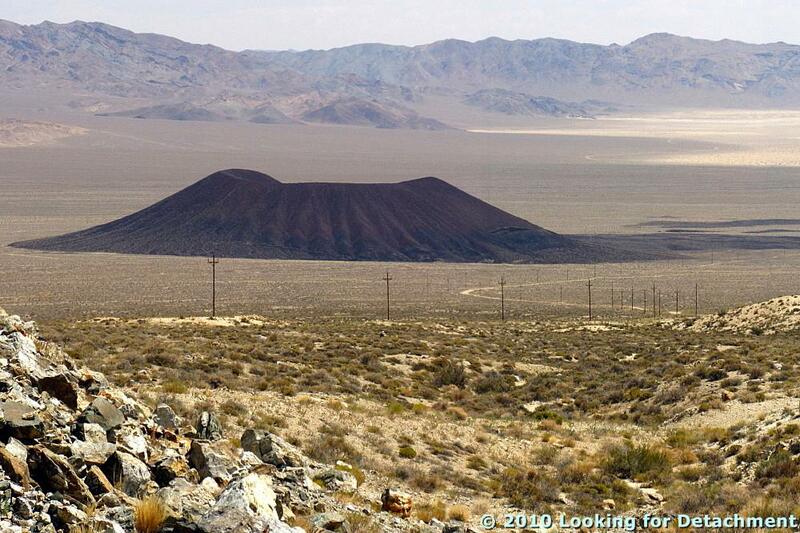 The high point in the photo, part of the Weepah Hills, reaches 7753 feet (2362 m). The Weepah Hills is a more-or-less circular batch of disorganized lowlands, hills, and mountains, with the apparently chaotic to jumbled geologic formations of the area having been horizontally sliced by low-angle faults of probable detachment origin. Tertiary Esmeralda Formation sediments and Quaternary older alluvium cover much of the western part of the hills; a granitic body, the Weepah pluton, probably the same age as the 70 Ma Lone Mountain pluton to the northeast, crops out in a broad area in the northern hills; and a couple small patches of Precambrian Wyman Formation and Reed Dolomite poke through near the central part of the area. The rest of the area is mostly underlain by Cambrian to Ordovician sedimentary formations. Sunshine Mining Company took out a bit of gold at Weepah in the mid 80s; a few other companies have taken a look since then, but so far no additional mining has resulted. 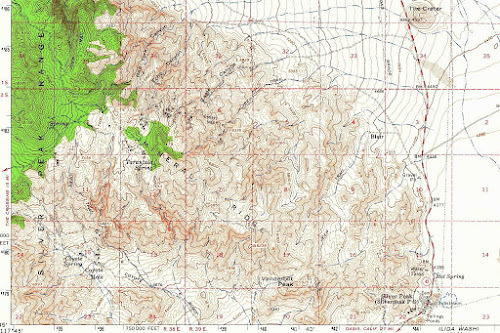 These topo maps show the topography and main features of the area. 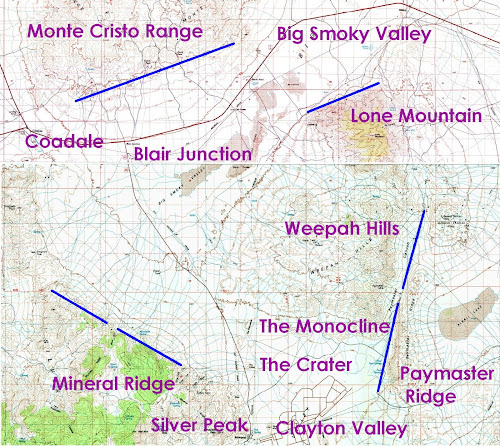 The spliced Goldfield and Tonopah 30 x 60 maps (courtesy USGS). The same map with a few labels. The whole area shown on these maps is detached. 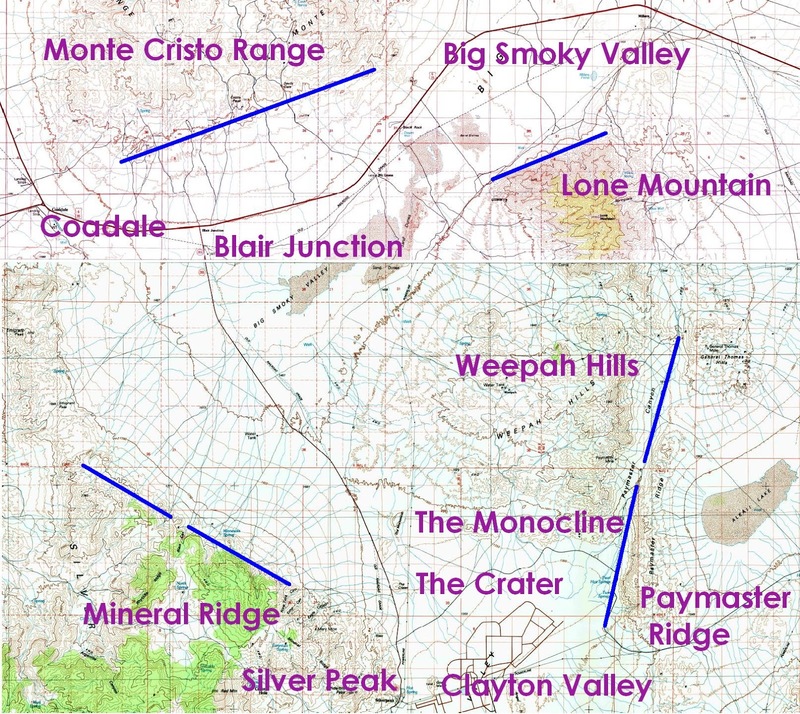 Here, I've thrown on a few lineaments, including one going up Paymaster Canyon, which gives the eastern side of the Weepah Hills a linear look. 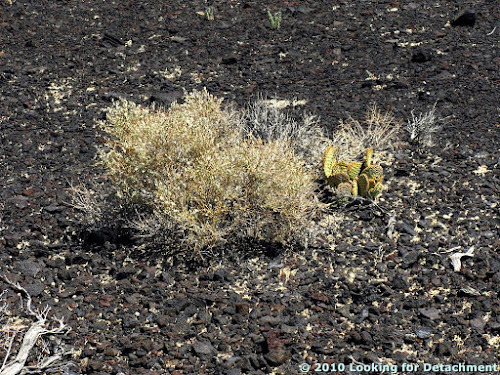 I probably drove straight on down to the cinder cone on my 1976 journey through the area, but on my more recent 2010 photo-taking expedition, I stopped near the old gate to look around at some of the old junk, and to take in the views. I'm not sure what this old sign said, but it's totally bitten the dust. 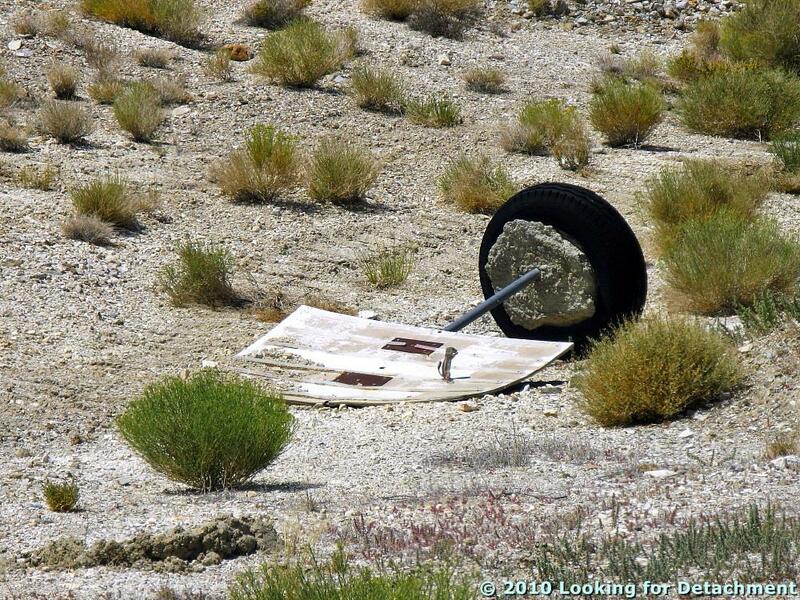 And it looks like it got run over by a tracked vehicle of some sort. 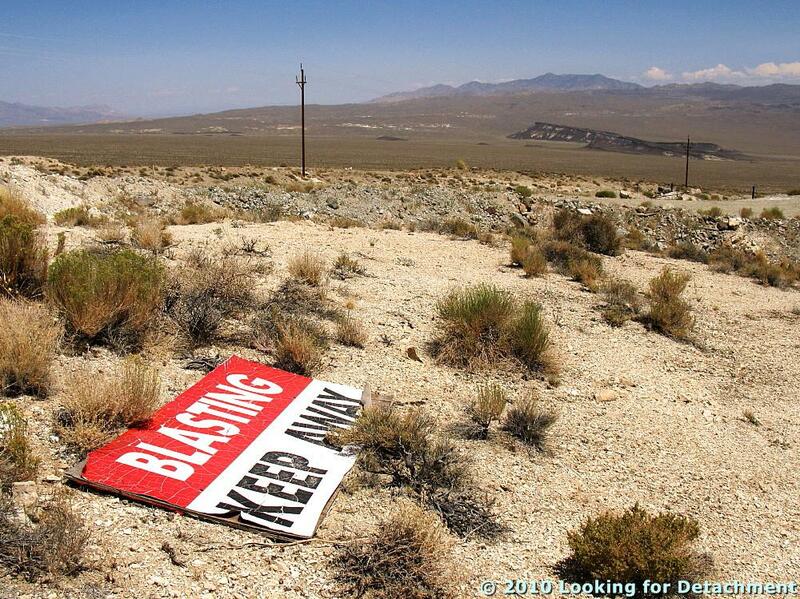 An old, though not very old, blasting sign. 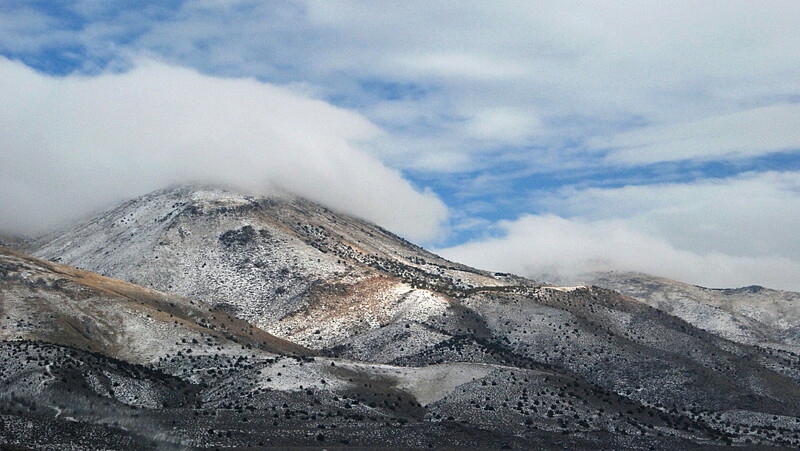 At The Monocline, a thin, dark basalt layer caps soft, white sedimentary rocks, which, according to the Esmeralda County report, are part of the Tertiary Esmeralda Formation. These units have been tilted, maybe as much as 10 degrees. A closer view of The Monocline and its closer, sister hill, from Google Earth. Strangely enough, I've never stopped at The Monocline, although it looks like there is a perfectly good dirt road to it! 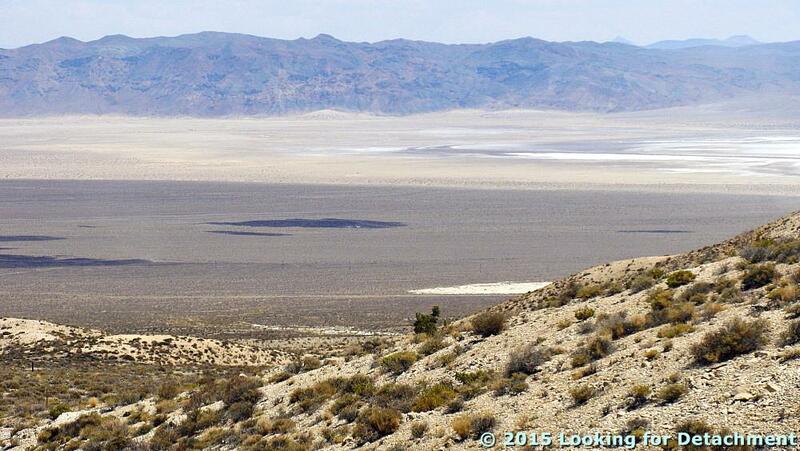 The Monocline, part of a mine dump, The Crater, and Clayton Valley playa. A closer look at The Crater is next ... as fast as we can get down the alluvial fan! List of minerals at Weepah: Mindat. 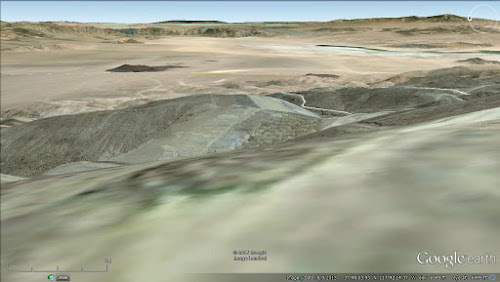 Weepah Mine: Western Mining History (info last updated in the 80s or 90s). Weepah Deep: unpub 1989 info from Sunshine Mining Co and FMC Gold. Weepah Mine in the County of Esmeralda Nevada: unpub 2008 report—much of this info is good, but ignore the Regional and Local Geology sections. Weepah Reconnaissance/Submittal Summary: unpub 2014 recon report. Maldonado, Florian, 1984, Bedrock geologic map of the Lone Mountain pluton area, Esmeralda County, Nevada: U.S. Geological Survey Miscellaneous Investigations Series Map I-1533. 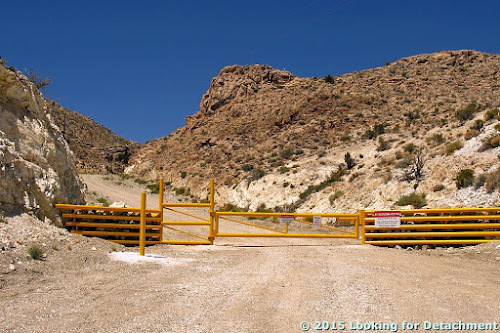 We paused our expedition in the Silver Peak area, after passing through a rusty, out-of-service gate in Eagle Canyon and arriving at a locked gate farther up the northern road to the top of Mineral Ridge. My goal in trying to gain access to Mineral Ridge was to check out the Mary Mine: It was one of several old mines on my list of possible thesis areas. In order to see what I was trying to do, let's look once again at the maps. 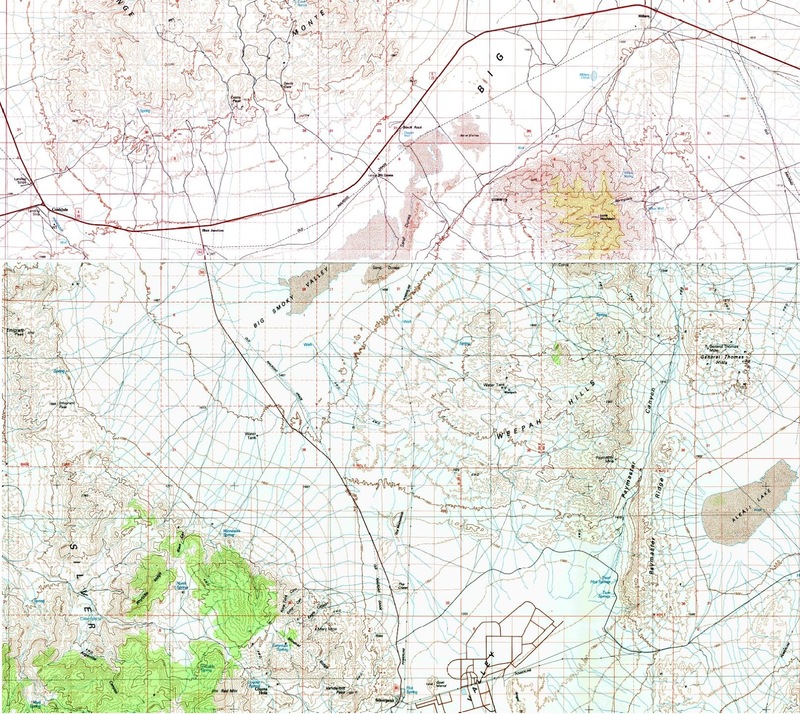 And remember from my previous three posts about the Silver Peak area, there were no mines shown on the old 2° map, so I won’t show that map again: The 2° sheet was useless to me. Here again is the SW portion of the Silver Peak 15' map, courtesy USGS. 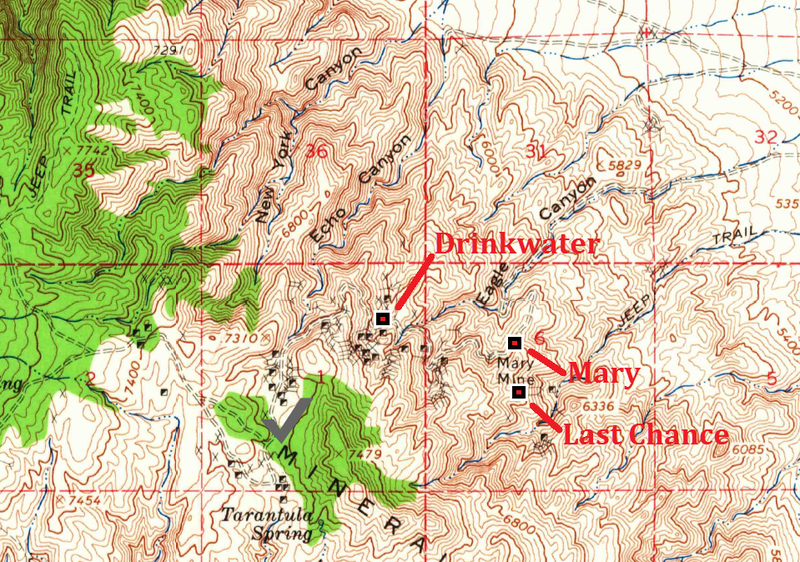 On the Silver Peak 15’ map, the Mary Mine is shown as an adit just below the main road to the Mary-Drinkwater complex in the NW 1/4 of section 6. Here I've zoomed in to our area of interest on the Silver Peak 15' quad, and I've added Spurr's locations for the Drinkwater, Mary, and Last Chance Mines. Which mine was I aiming for? 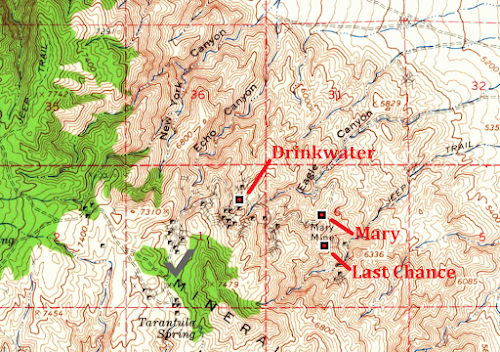 I was shooting for the Mary Mine, the only mine named on this part of the 15' map. As for other mine names and locations, I would have gone with the names Spurr used in his 1906 report: Spurr was there when the mines were first active and had just been named, so surely his locations were correct. My other options for accurately identifying which mine was which would have been to return to Silver Peak to locate an oldtimer or two to see what they might say—and some of the oldtimers would have been extant back then, but they are now mostly long gone—or to go to the Esmeralda County courthouse in Goldfield in order to research the names of the old claims and patents. As we can see above, Spurr had the Drinkwater located up the old road, the one that is still hand-rocked in a couple places. Spurr put the Mary Mine at the site of an old mill complex, and he placed the Last Chance Mine in Custer Gulch, which is south to southeast of Eagle Canyon. The old mill isn't shown on the 15' map, and Custer Gulch isn't named. 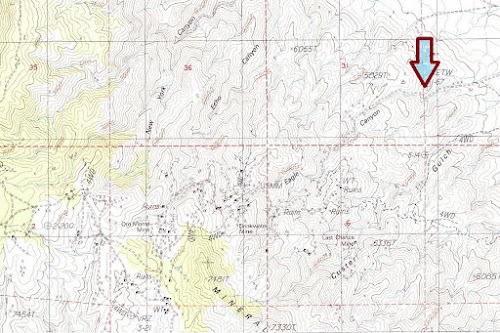 The Drinkwater, probably a single operating mine or even a single claim when Spurr visited in 1906, was shown on the 1963 map above—and on the 1987 map below—as a complex of shafts, adits, and prospects near the head of Eagle Canyon (and now it's covered in part by a more recent open pit). It was the Drinkwater complex that I could see from below, and it was what I headed for when I left my Opel. As for the Mary Mine itself, for this narrative I'll take it as the adit located not far above Spurr's location. And I’ll take the Last Chance Mine as the set of shafts, adits, and prospects in Custer Gulch (see below). 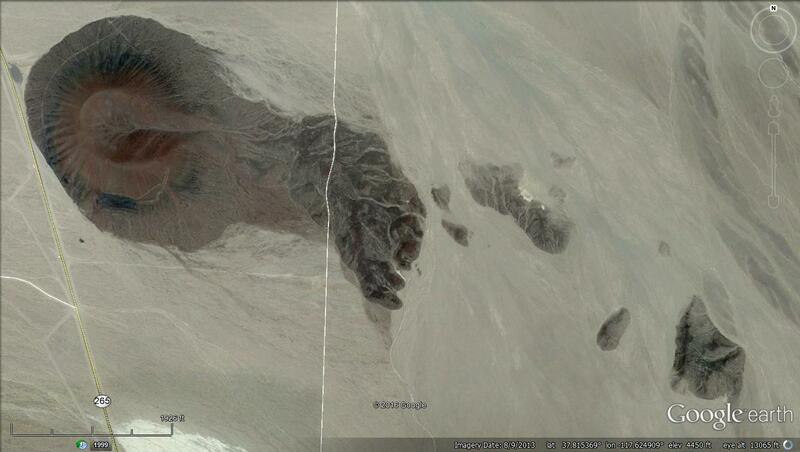 A portion of the Silver Peak 7.5' quad, courtesy USGS. The arrow shows the probable location of the Opel in 1976. This map was published in 1987, long after my thesis quest had ended. I love the names on some of these maps! And, gosh, the Mary Mine isn’t even shown on this more detailed, more recent 7.5' quad. 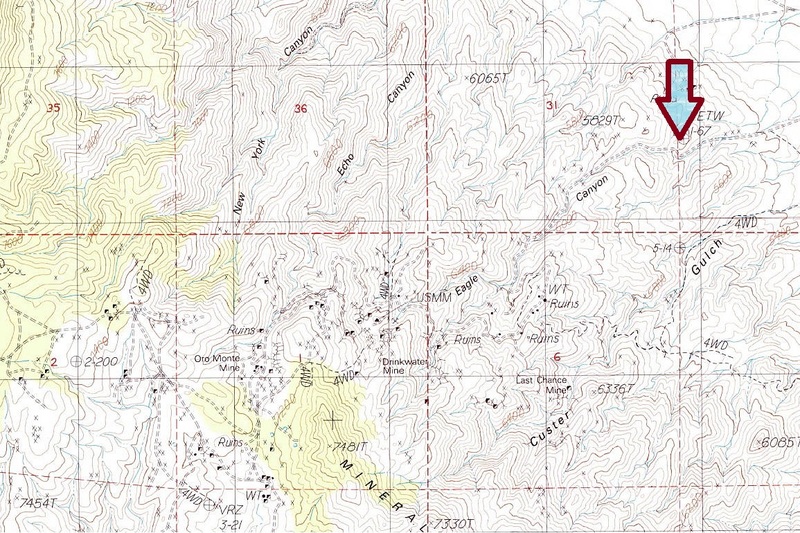 Spurr’s Mary Mine location is the same as what's shown above as “WT – Ruins” in the north-central part of Section 6. I parked the Opel—as near as I can tell from my 1976 memory and from the memory I have of going up and down that road several, I mean innumerable, times in the 1980s and 1990s (mostly down, because that was the most impressive direction to travel, last attempted in 2000 when the road didn’t go through due to locked gates)—on the "road" (remember, the road was washed out) just below the red/blue arrow. As for the old road, maybe you can see it here on this enlarged Google Earth view, up near the pass to the other side of the hill near the Oromonte and Wedge Mines, where I used to work back in the 1980s. A good portion of the hand-rocked road has been destroyed since I last drove it sometime in the 1990s. 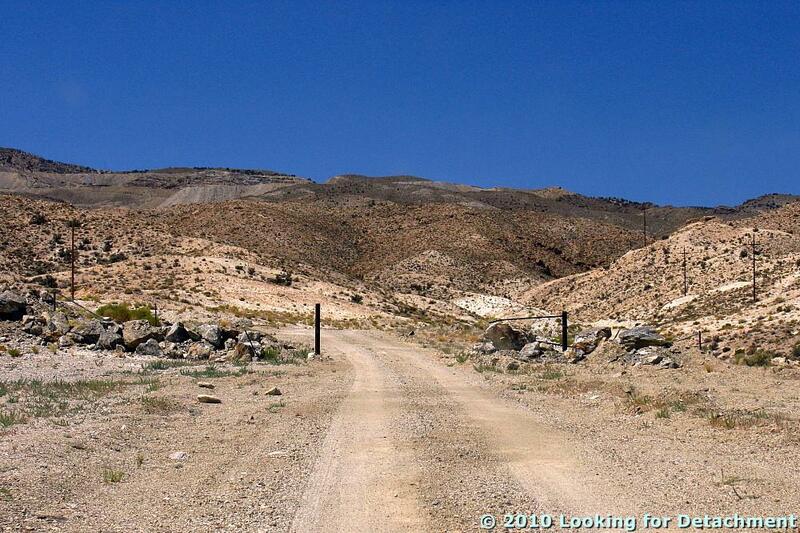 The old road is the upper one, shaded on its lower side because of the hand-built rock wall that holds it up. The view driving down the old road was truly spectacular, and the drive was breathtaking, even hair-raising if you had never seen a road like that. The road was incredibly narrow, wide enough to drive down but no wider, and it was quite rocky. The effect, for the driver, was one of intensified concentration: It was an exercise in dodging rocks and making sure the left tires never went over the edge. The edge, a seemingly endless drop off to the north, was ever present, right there where a driver might usually prefer to place the left-front tire (once the left-front or right-front tire is placed, according to one’s best judgement hopefully based on past experience, the position of the rest of the vehicle, in this case a mid-80s Ford half-ton pickup, naturally follows). I thought of it as the scenic route: a route not taken daily because it took longer to get back to Silver Peak, a route that took even longer as a side trip on the way back to Reno from the south. It was also a fun route, fun because I could navigate the road with aplomb: I could dodge this rock to the left or right by careful placement of the front tires; I could make sure the front differential missed some critically high or pointed rock near the center of the road; I could place the left tire as close to the nearly overhung edge as needed, providing that the berm, if present, wasn't too soft to drive on. 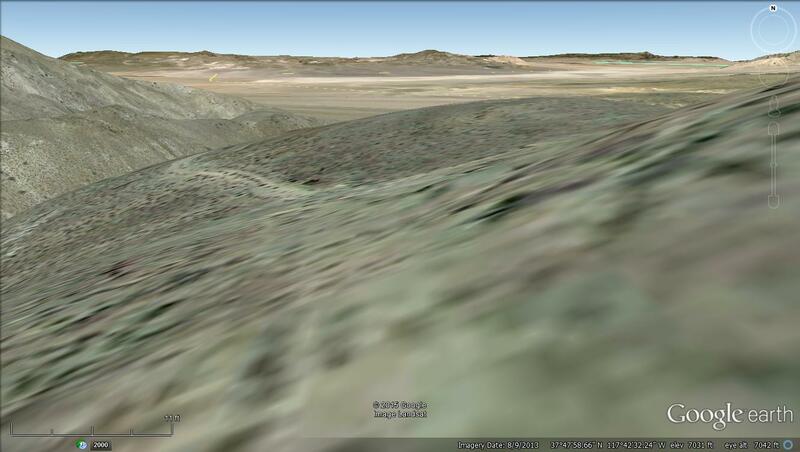 Google Earth view from the old road, looking off to the north, down Echo Canyon toward the Monte Cristo Range. It was also fun to take a passenger down that road, especially if they had never seen so precipitous a road or so expansive an overview. This historic, hand-built road, with a superbly constructed rock wall holding up the steep, north side, was not intrinsically dangerous, and it wasn’t the narrowest or sheerest road I had ever driven up by the mid-1980s, but with the extremely spacious view out the front windshield, it was impressive to anyone who had not been up or down a road quite like that. I remember unease and tension from some less experienced passengers (hopefully it wasn’t my driving!). Google Earth view from the old road looking east. 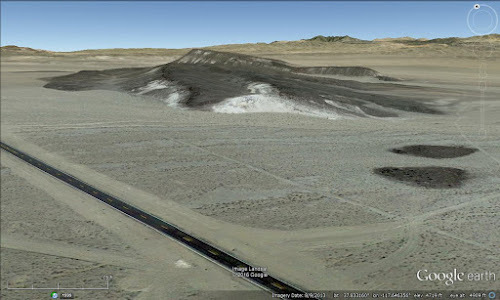 The cinder cone called "The Crater" is the dark blob left of center in the basin (Clayton Valley). After hiking uphill a ways, I come to the part of the road that curves around an unused core shack (which is there from my future memory, at least, and which may have been built by Freeport or some other mining company after my 1976 visit, although they may have used one of the old buildings, maybe this one). Across from the shack stands the dark, often silhouetted skeleton of an old mill (see this photo), swaying and creaking and rumbling in the wind. I look at the rocks scattered around the rusty old mill and see a lot of chunks of weathered quartz vein, leftovers from the district’s historic mining. I ponder the strange batch of unfamiliar rocks. I’m completely baffled. Looking away from the rocks around the mill, I look up toward the mountain, noticing how far it is to the main part of the Mary-Drinkwater complex, up a road I won’t be able to access in my Opel. The view of the stark, nearly treeless mountain—something I wasn't used to back then, having just arrived in the west from my forested, eastern previous life—conspires to make my goal recede away from me, up the oddly elongated road into terrain that looks more formidable than seems possible, even given the area’s legitimately barren countenance. Remnants of the mill continue to make eerie, creaking sounds. The place is ghostly, almost haunted. I’m unreasonably spooked. I make my way through the wreckage and the leaverite rocks. I marvel at the view—the broad reaches of the basin more than 2000 feet below, the ragged heights of the ridges more than 1100 feet above. A view of Clayton Valley from Eagle Canyon, though not from the old millsite. I survey the wide expanse of Clayton Valley to the east and the confusion of hills and mountains beyond. The red and black cone of The Crater, formed of steeply reposing cinders, rests below me at the junction of fan and basin. Behind me, the northeastern slopes of Mineral Ridge—cut by various canyons and gulches, scrabbly-looking and with loose and fragmented rocks just waiting to give way beneath an unsuspecting boot—are capped by a nearly horizontal surface and by two slanted, oval mounds of rock that rise above that surface, one to an elevation of nearly 8400 feet. After a while I hike back downhill to my car. The old mill, enduring weather, time, and passing-through geologists, is now behind me. I haven’t lost the creepy feeling; in fact, it has intensified. I stop to look over my shoulder a few times, feeling strongly like I’m being watched or followed. Surely a mountain lion is behind me, stalking, as they sometimes do when you’re out in the field walking around by yourself. They aren’t usually up to any mischief: They’re just curious. Back then, however, I wasn’t used to things like that, and I couldn’t shake the eerie feeling. Nevertheless, when I got back to my car, I made camp, albeit just a little farther down the road. Will this be the spot? I have one more place to visit. 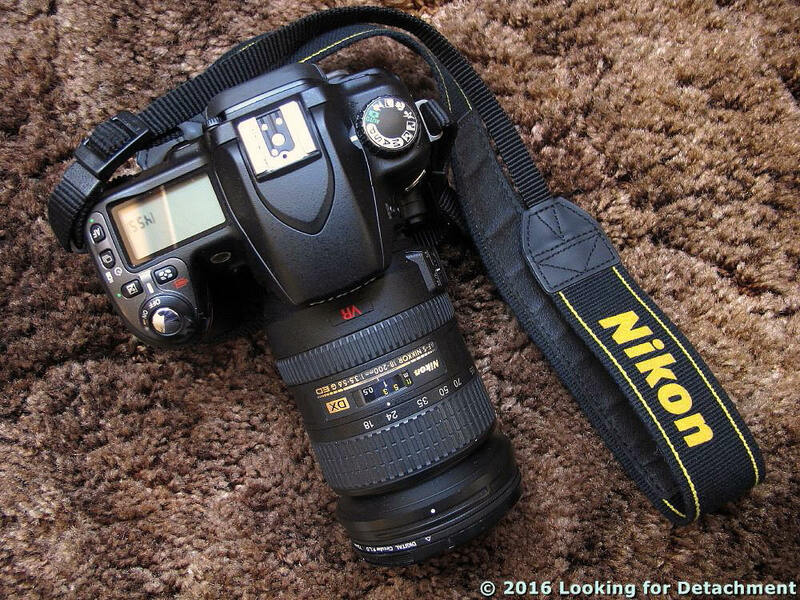 Yes, that's an 18-200 mm zoom. This isn't really a new camera, but it's new to me. It's old, probably from 2006 or 2007. I inherited it from Alaska Al. You saw some of my first photos from this DSLR a couple weeks ago. So far with this camera, I've been using auto white balance (AWB), although I know the camera will shoot warm under indoor lighting, and so it will usually require a change to tungsten or something else when indoors. With AWB, the color on the LCD screen has, so far, fairly well matched the color of what I see when shooting, or maybe it's too reddish or bluish on occasion. Of course, when using a DSLR one can't actually see anything on the LCD screen until after taking a shot, because the process of DSLR is different, and one looks into the viewfinder to see exactly what the camera is seeing. 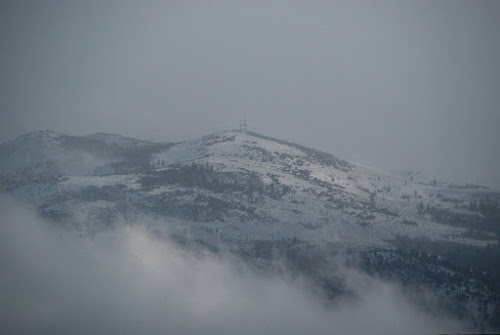 These first pictures below were taken from 395 north of Reno on a fairly gray day. I've enhanced the photos such that they look to me the way they looked on the LCD screen, although they are all probably off, in color, by a hair. I think the next picture could be slightly yellower, but my opinion of it seems to vary depending on what I looked at last. Sunlight hitting the west part of Seven Lakes Mountain, the part that's in California. The next photo was shot from a moving vehicle with ISO 800 (not really fast enough for the conditions) at 200 mm zoom (35mm equivalent of 300mm). It was slightly unsharp, though not from the motion; I've since modified the D80's sharpness settings. I've cropped the photo slightly to suit my idea of best composition (hence, it's been enlarged very slightly). Some rocky crags on Petersen Mountain (MyTopo location). Petersen Mountain, on the crest of the range not far to the right of the photo, is the site of active quartz crystal mining. Petersen Mountain from a little farther south. 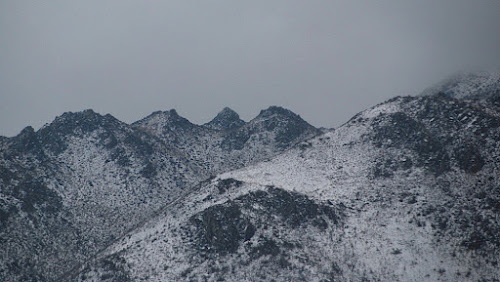 The photo was taken from about here (Google Maps location), looking southeast toward the high point of the Petersen Mountain (range): Petersen Mountain (summit). 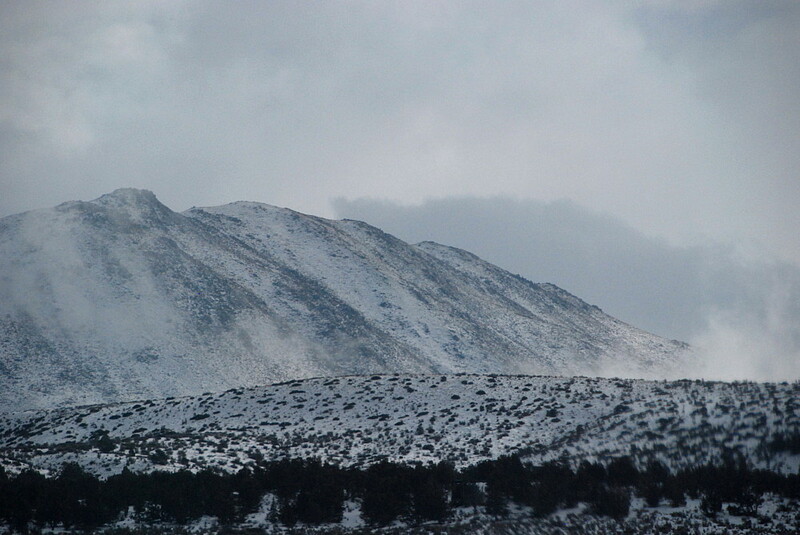 And here's a shot of one of the northern peaks on Peavine, looking southeast from about the stateline near Bordertown. The camera shows quite a bit of vignetting at 200 mm. I have, in the meantime, taken a lot of nice photos, particularly some zoomed-in photos of birds. But I'm still figuring out the many settings and possibilities, and am finding the color a little odd in shadowy settings. Heading north out of Silver Peak, with The Crater in view. 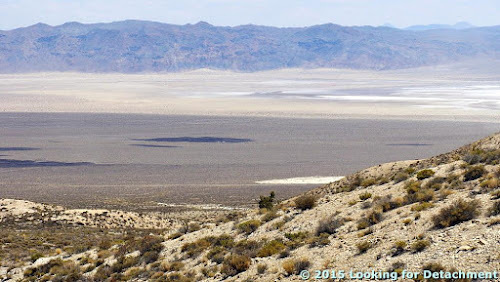 After checking out the southern route to Mineral Ridge while on my 1976 thesis quest, I headed north out of Silver Peak on then Highway 47 (now S.R. 265), carefully measuring the miles to the left-hand turnoff. 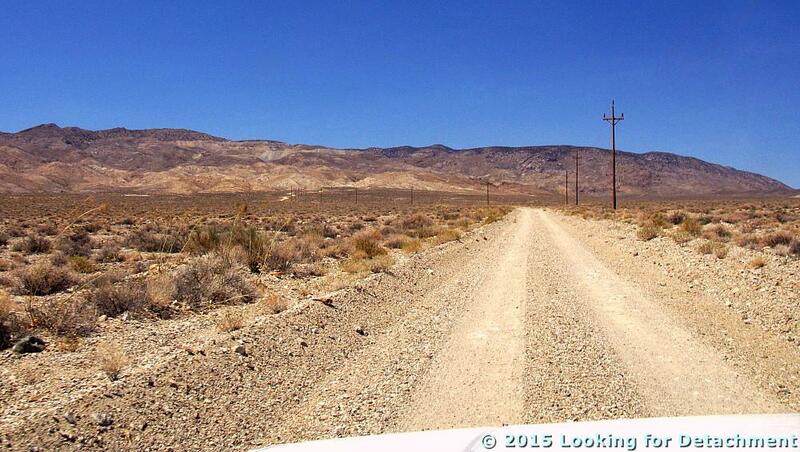 This time, the road was exactly where the map said it would be, and it was a fairly good, bladed dirt road. And, if you remember from my last post in this series, I was on my way to the Mary Mine. Today, the Mary and nearby Drinkwater Mines are often combined together as one agglomeration known as the Mary-Drinkwater Mine or complex, and both are part of Scorpio Gold Corp's Mineral Ridge project, which has been in production since 2011. Mineral Ridge on a portion of the Silver Peak 15' quad, courtesy USGS. 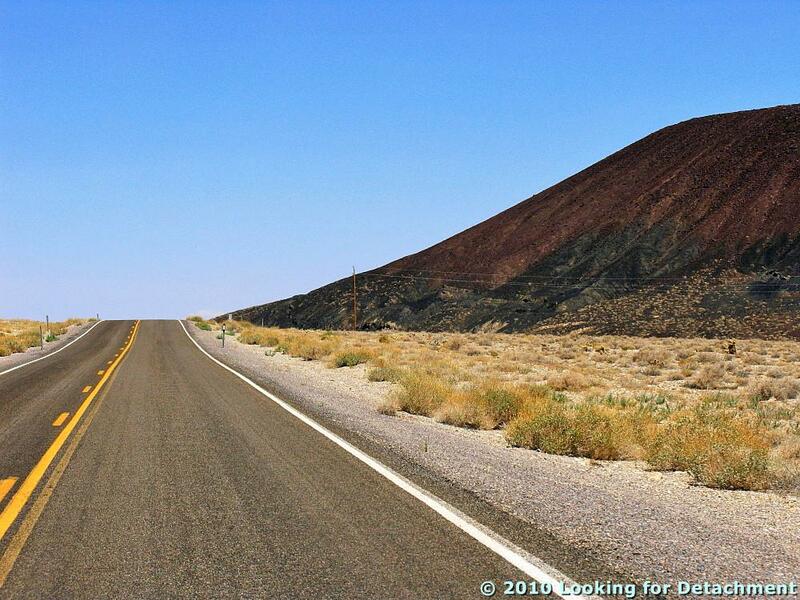 The road I took is the double-dashed track going west from old Highway 47 about a quarter mile south of The Crater. As can possibly be gleaned through past explorations of double-dashed roads in my ’72 Opel back in ’76, on older maps, especially ones dating significantly before the time of the exploration, these roads might have been anything from great, graded gravel roads to terrible two-track roads that were barely visible through overgrown sagebrush. I was fortunate this time, or so I thought as I turned west. 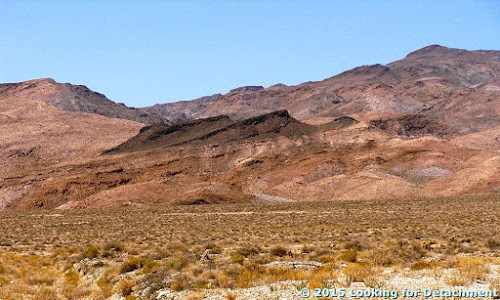 And now, I'll go into the geology of Mineral Ridge just a little, as per my memory from work done there in the mid-late 1980s and published work available online or in journals I have on hand. We are at the road junction, looking to the southwest. We can see quite a bit from this viewpoint, notably the Mineral Ridge detachment fault and the Mary-Drinkwater Mine, labeled M-D Mine. The Mineral Ridge detachment fault, in bright red above, places mostly Cambrian sedimentary rocks of the upper plate over the Precambrian to Cambrian Reed Dolomite, the Precambrian Wyman Formation, and early Tertiary-aged alaskite and granite of the lower plate (Noland et al., 2015). The details may be somewhat complex. Two notes worth mentioning: 1) I've labeled the seds of the upper plate as "ЄpЄ" because although the upper plate rocks are dominantly Cambrian, there may be some late Precambrian rocks in one area, and 2) The Reed Dolomite is often shown as straddling the Precambrian-Cambrian boundary, but it is sometimes assigned exclusively to either the Precambrian or Cambrian. I'm treating it here as ЄpЄ. The low-angle fault shown in dark-red above—it’s somewhat left of center—places tilted dark rocks, presumably of the upper plate, over seemingly less tilted or nearly flat-lying, orangey Reed Dolomite. The Reed is usually placed in the lower plate of the detachment (as it is here), but rarely, as in this article, it is placed in the upper plate. I place it in the lower plate or treat it as its own structural plate, as in this abstract, which unfortunately cannot be read online without some rigamarole (or maybe can't be read at all). The Reed Dolomite is very thin on Mineral Ridge, it’s possibly attenuated, and it often looks microbrecciated. Although not obviously ductiley deformed, carbonates such as the Reed can be ductiley deformed and not show it: they can heal and recrystallize as fast deformation can occur, making ductile fabrics—if any formed—difficult to identify. I’ve marked this probable detachment surface—in the labeled photos above and below—in dark red, to contrast with the bright red of what I know to be the Mineral Ridge detachment fault. Here's a closer view of that low-angle surface. It's probably a continuation of the Mineral Ridge detachment fault, only lower in elevation and closer to us. 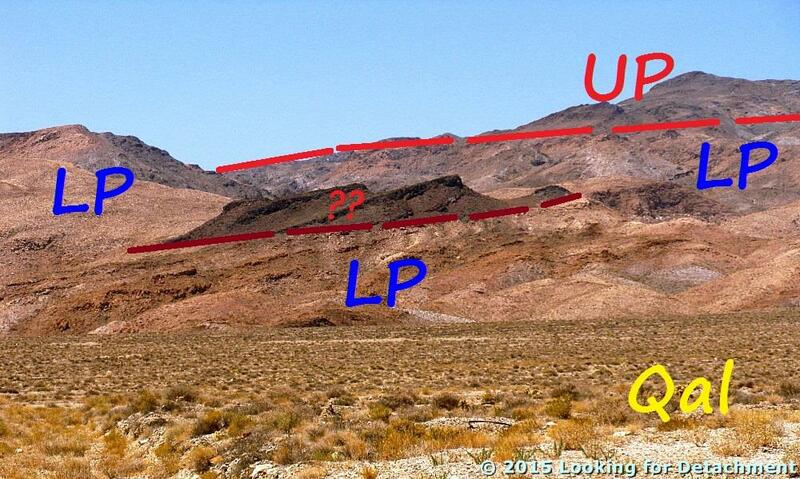 I've labeled the known upper plate (UP) and lower plate (LP) rocks. The ?? in bright red is probably upper plate. I'm only saying that the dark-colored rocks of these photos are "probably" upper plate because I haven't personally walked this ground, unlike many other sections of ground on Mineral Ridge. They are shown as shown as Cambrian limestone and dolomite undivided here, with the fault being the Mineral Ridge detachment fault. Because from a distance the tilted dark-colored rocks look to me like Tertiary volcanic rocks, I'll add another side note: A small hill of Tv occurs south of the Oromonte and Wedge Mines (south to SSW of the Mary-Drinkwater complex). When I mapped in the area, I wondered if the reddish volcanic unit exposed on that small hill was tilted as part of the upper plate, or untilted as part of a younger unit erupted after detachment faulting ceased. I don’t really remember my conclusion. 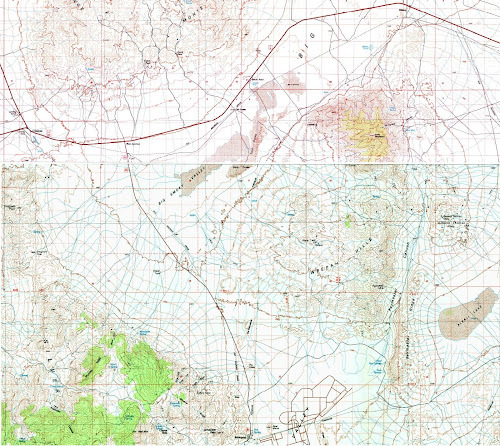 On this map (Diamond and Ingersoll, 2003, p. 464), the Tv is post-detachment and lying on top of Te (Tertiary Esmeralda Formation), which I recall as being tilted (the Te is in the upper plate of the detachment fault, whereas the Tv overlaps the detachment fault and therefore post-dates it). Onward I drive: up the coalesced alluvial fans emanating from New York, Echo, and Eagle Canyons, Custer and Great Gulches, and other lesser gulches and canyons. I was finally on the northern approach to the Mary Mine and the top of Mineral Ridge. The road in 2010. It's unlikely that power lines paralleled the road in 1976. Woh! Suddenly the road ends in a huge washout. But in 2010, the accessible part of the road ended like this. Locked gates are the way of the mining world. I have some things to say about locked gates, but I’ll save them for another post. Still in the Opel, I carefully meander up the sandy dry wash until I come right up against a 50-foot-high wall of dirt and rock: Instead of a road, I’m looking at a filled-in canyon between two cliffy ledges. I know the road continues on, somewhere beyond this pile of debris, but I can't get to it! 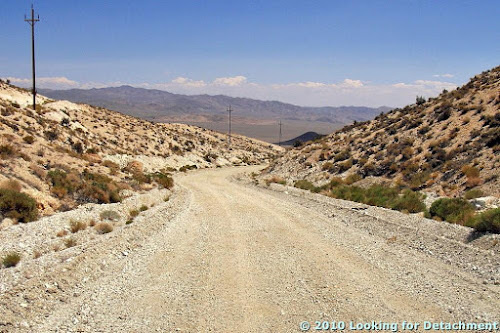 I walk around, searching unsuccessfully for a go-around or bladed connection between the washed-out road and the rest of the road. Resigned to hiking, I park in the sand wash, carefully pointing the car downhill for a quick getaway; I get my field gear and maps out of my car and start walking up the hill toward the Mary and Drinkwater Mines. Diamond, D.S., and Ingersoll, R.V., 2002, Structural and sedimentologic evolution of a Miocene supradetachment basin, Silver Peak Range and adjacent areas, west-central Nevada, in The George A. Thompson Volume: The Lithosphere of Western North America and Its Geophysical Characterization: International Geology Review, p. 588-623. 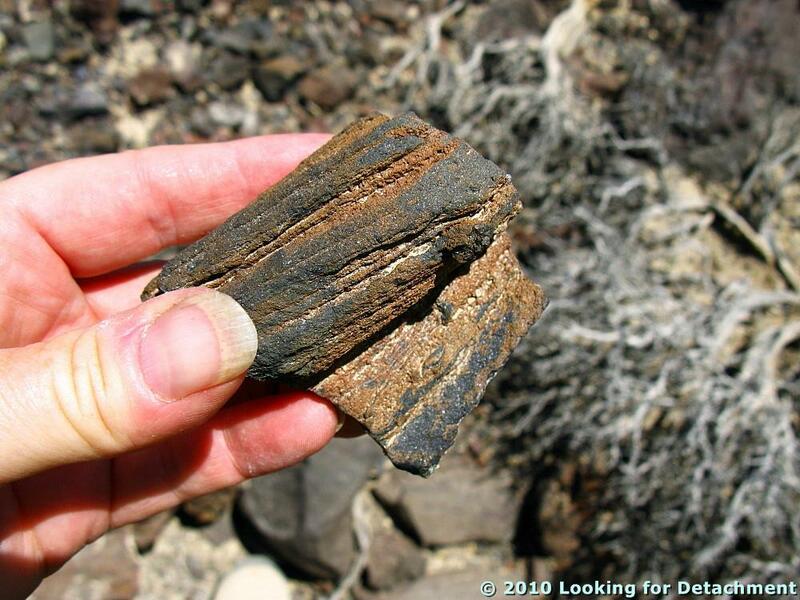 Noland, P.D., Briscoe, Scott, and Hawley, P.J., 2015, Genesis and Timing of Gold Mineralization at Mineral Ridge, Esmeralda County, Nevada, and Implications for Future Exploration and Discovery [entire article], in New Concepts and Discoveries, GSN 2015 Symposium Proceedings: Geological Society of Nevada, p. 153-168. Powers, S.L., 1988, Two lineation directions in the Mineral Ridge core complex, Esmeralda County, Nevada [abs, not available]: Geological Society of America, Abstracts with Programs, v. 22, no. 3, p. 222. Wesnousky, S.G., 1994, Evaluation of the geologic relations and seismotectonic stability of the Yucca Mountain area, Nevada Nuclear Waste Site Investigation (NNWSI), Progress Report 30 September 1994: UNR, Mackay School of Mines, Center for Neotectonic Studies. Accessed via NRC website.